Powers/Abilities: Master of disguise, excellent fighter, appears to possess hypnotic powers. Commands an organization of circus people and reformed thugs. Pilot, with his own plane (remember, this was 1917, so having your own plane was extremely rare). Owns hidden lair, where he interrogates his prisoners through a "television" screen -- everything Judex writes on the screen on his desk appears on a similar screen on the wall of his victim's cell. History: Dressed in a slouch hat and dark cloak, the crimefighter Judex stalked the shadows of France, appearing and disappearing like a ghost. After a parent was slain by the villainous banker Favraux, Jacques de Trémeuse adopted the costumed guise and assembled an organization of ex-criminals and circus people to assist him. He fought Favraux and his lethal mistress Marie Verdier, eventually capturing them. Having fallen in love with the innocent daughter of Favraux, Jaqueline, Judex opted to let the criminal live, instead seeing that he was imprisoned. Comments: Created by Louis Feuillade and Arthur Bernède. 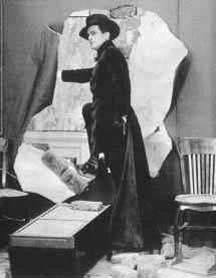 Having been criticised for producing film serials which allegedly glorified criminals (such as Fantômas and "les Vampires"), screenwriter and production head of Gaumont Studios Louis Feuilldade determined to create a crimefighter instead. Working with fellow writer Arthur Bernède they developed Judex, who debuted in a 12 part serial of the same name in 1917. A second serial, La Nouvelle Mission de Judex (Judex's New Mission), followed in 1918. In both cases Judex was played by French heart-throb René Cresté, while Louis Leubas portrayed Favraux. The first serial was remade in 1934 with René Ferté in the part, and again in 1963 with American stage magician Channing Pollock as Judex; Pollock added elements of his own stage act into the film..
Much of the information on this page comes verbatim from Cool French Comics, used with permission. Likewise the images. Thanks to Trish Randall for informing me of Judex's brother.